This was considered especially true of two spirits. Traditionally, one would have known a two spirit due to the fact that he would have had some sort of transformational dream that revealed to him his two-spirit status. One would never ignore such a dream. It elevated and individual within that tribe, and singled that person out as someone special. Dreams were considered messages from the spirits to an individual. And given their closeness to the spiritual, a two-spirit was especially good at receiving dreams and interpreting the messages within them. The Ojibwe believed that two-spirits were particularly adept dreamers – they could in fact see the future. I try to honor this tradition with Joshua, my gay teen protagonist. He discovers that through dreams, he can peer into the future and capture brief, often puzzling, fragments of what is to come. As the Native American Shaman, Lame Deer, once said: “Nature doesn’t make someone different without also giving them a special power.” Dreaming is Joshua’s power. I personally believe there is a larger reality beyond the one we know about – and that one can access that through dreams. But I’m even more fascinated by how this belief got associated with two-spirits. The reverence for people who are different is the Ojibwe way of saying that everyone should be honored and respected and has something important to contribute. Two-spirits provided visions for their people—visions which guided, inspired, and motivated them. Dreamers thus played an essential role in society, one that was rightfully celebrated. Imagine living in such a world for a moment—a world where as a gay person, you are celebrated, rather than denigrated, and elevated due to your special connection to god. This world is foreign to many gay people today. But you need to understand that God doesn’t hate you just because society does. Denigration of gay people is not universal. In another place, and another time, you would have been revered for your closeness to God, not condemned as an abomination before him. 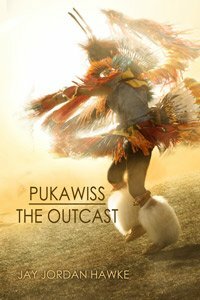 I offer my readers a small taste of that world in Pukawiss the Outcast. Note: I love the fact that the Ojibwe word for dream, Bawazigaywin, has the English word for gay within it. Synchronicity is what makes life so interesting and meaningful sometimes. Jay Jordan Hawke (Jayhawke) spent way too much time in college and holds a bachelor’s, master’s, and Ph.D. in history, as well as a second master’s in Outdoor Education. He loves everything sci-fi, especially Star Trek, and hopes to be on the first starship out of here. In the meantime, he teaches high school full time and anxiously awaits the day when he can write full time. His hobbies include camping, reading, running, writing, and attending powwows. He resides in one of the Great Lakes States near the capital of Tecumseh’s Confederacy. Jay Hawke loves to interact with fans through social media and can be reached at the links to the right.